Yesterday, I posted about my new diaper bag, part of the Pinterest Challenge. Good news - I have 2 more projects coming. They've been complete for a while now, but between the new job and having a one year old, I just hadn't blogged about them yet. 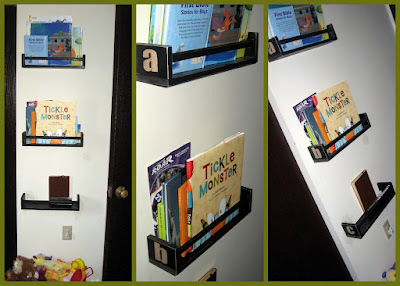 So, stop number two on the Pinterest Challenge train brings us to these awesome Ikea Hack book shelves. Unfortunately, our closest Ikea is about 2 hours away. When we visited Herb's family in Pittsburgh for Christmas, we visited the Ikea there and I picked up three Bekvam spice racks for $4 a piece. I really would have liked to buy five, but I could only find three in stock, which is a good thing, because Levi's room doesn't really allow for more. I cut out a, b, c (two of each) in black vinyl on my Cricut using the blocky Impact font. If you've never cut vinyl, check out this post. I placed the letter on the sides of the assembled shelves and went to town with black spray paint. After the shelves had dried, I peeled off the vinyl and gave the shelves a good roughing up with sand paper. The next step almost killed me. 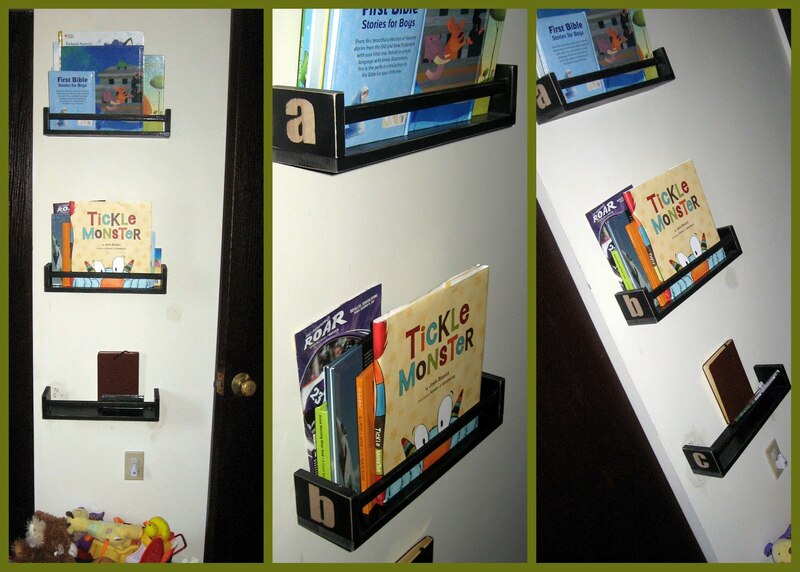 The shelves hang by two srews on your wall. For whatever reason, I had to drill no less that 6 sets of holes to get the "c" shelf hanging correctly. "A" and "B" were no problem at all. This is part of the reason that I haven't posted these shelves in the two months that they've been done. "C" has been the bane of my existence. I am relieved to report that the are all living happily on Levi's wall right inside the door. And "C" is getting what he deserves now, too. "C" is the only shelf Levi can reach, and therefore, he is almost always holding no books. In fact, yesterday there was a water bottle shoved onto the "C" shelf. Take that! I definitely snuck these "after" photos while Levi napped. Shhh!